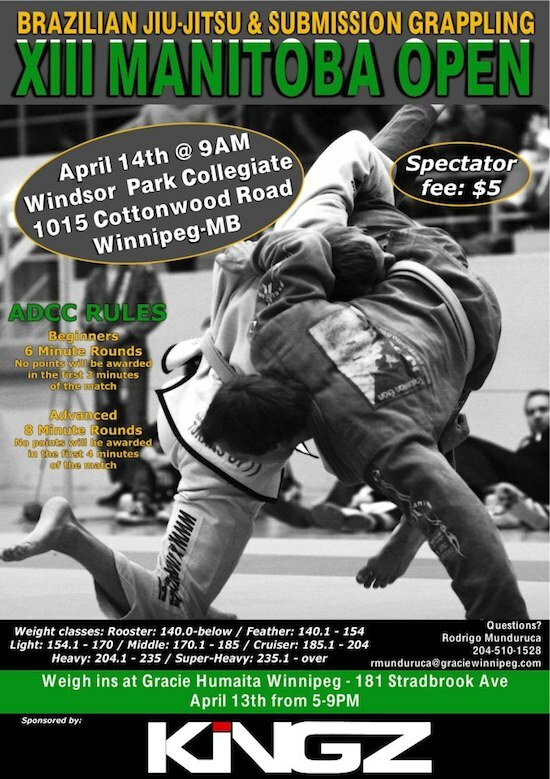 A mixed martial arts tournament this weekend in Winnipeg will draw competitors from across Canada and the U.S.
Windsor Park Collegiate will host the XIII Manitoba Open of Brazilian Jiu-Jitsu and Submission Grappling on Saturday, April 14 at 9 a.m. The event gives grapplers of all levels and all ages the chance to put their skills to the test. Matches will be six-minute rounds for beginners, with no points awarded in the first three minutes of the match. Advanced eight-minute rounds will be dealt no points awarded in the first four minutes of the match. Spectator tickets are $5 at the door. Competitor fee is $50, with weigh-ins at Gracie Humaita Winnipeg, 181 Stradbrook Avenue, on April 13 from 5-9 p.m.